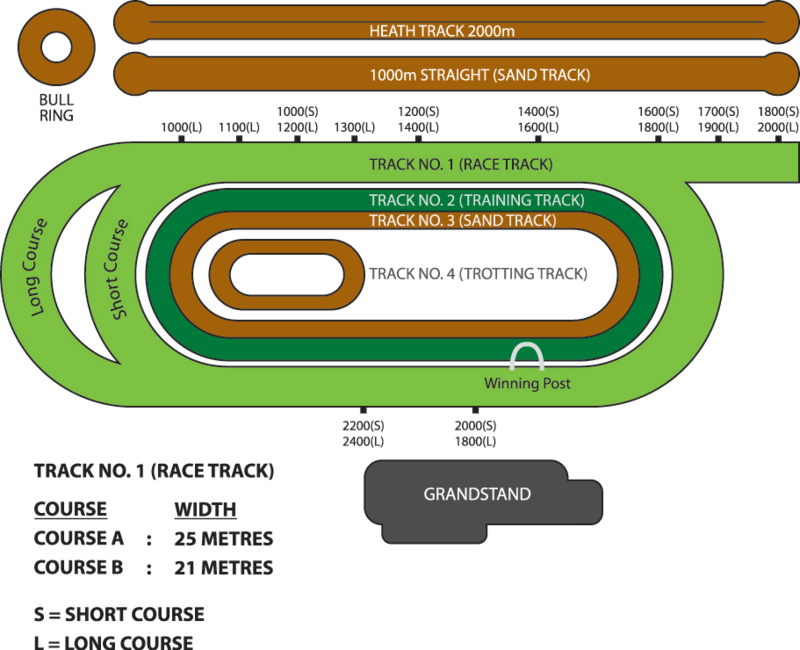 The Main Racing Track can cater for distances ranging from 1,200 to 2,400 metres races and 25 metres width and is a left-handed oval shaped grass track turfed with Zoysia El-Toro turf. The Zoysia El-Toro turf track has a deep-rooted system, which provides a cushion effect for the horses. The track is made up of a profile that incorporates a base drainage layer of gravel perforated by sub-soil pipes with a lower layer of sand and an upper root zone layer. The lower layer helps in the fast drainage of water. The sand, gravel layer and sub-soil pipes provide a quick and efficient draining of water even during the heavy rainfall. It is very rare to find the Main Racing Track condition going below yielding and even if it does drop to yielding zone, the track would recover to its good going in no time. The unique feature of this track is the two elevated bends cambered at an angle of 1 in 11, which enables horses to gallop at full speed into the bend thus gaining momentum before heading for the home straight. This ideal camber has been known to enhance the competitiveness while giving fair opportunity to all the runners regardless of the drawn barrier of the horse.